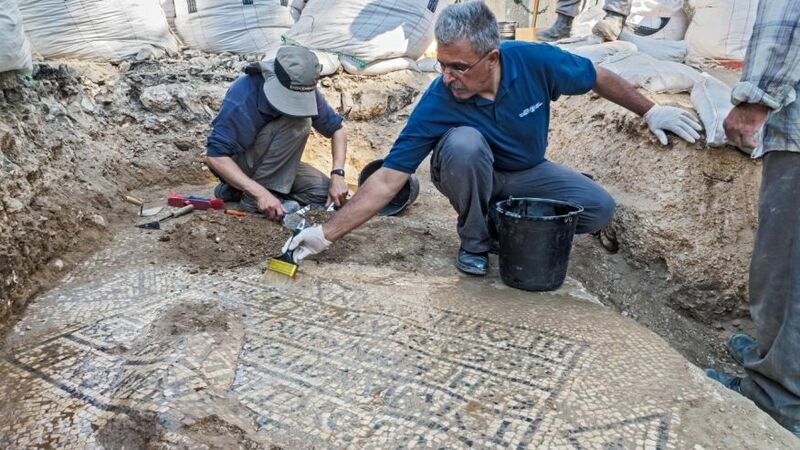 An ancient Greek inscription was found on a 1,500-year-old mosaic floor near the Damascus Gate in the Old City of Jerusalem. Byzantine emperor Justinian, who ruled in the 6th century A.D., is mentioned in the inscription, which was deciphered by Dr. Leah Di Segni of the Hebrew University in Jerusalem. It reads: “In the time of our most pious emperor Flavius Justinian, also this entire building Constantine the most God-loving priest and abbot, established and raised, in the 14th indiction.” EXPERTS UNCOVER EVIDENCE OF ANCIENT JERUSALEM’S DESTRUCTION BY THE BABYLONIANS In a statement released by the Israel Antiquities Authority, Dr. Di Segni explained that the inscription commemorates the building’s founding by a priest called Constantine. “Indiction,” she noted, is an ancient method of counting years that was used for taxation purposes. The mosaic has been dated to 550 or 551 A.D – experts believe that the room was used as a hostel for pilgrims. The floor was discovered this summer during preparations for laying communications cables near the Damascus Gate. “The fact that the inscription survived is an archaeological miracle,” said David Gellman, who directed the excavation on behalf of the Israel Antiquities Authority. Gellman noted that ancient remains at the site had been badly damaged by groundwork in recent decades. “We were about to close the excavation, when all of a sudden, a corner of the mosaic inscription peeked out between the pipes and cables. Amazingly, it had not been damaged.” An important historical figure, Flavius Justinian was emperor when the later Roman empire completed its conversion to Christianity. He also established a large church in Jerusalem dedicated to Mary, the mother of Jesus, known as The Nea Church, also known as The New Church. The church’s abbot was Constantine, whose name also appears on the mosaic floor near the Damascus Gate. Di Segni notes that the mosaic floor inscription is similar to an inscription found in the vaults of The Nea Church. “This new inscription helps us understand Justinian’s building projects in Jerusalem, especially the Nea Church,” she wrote. “The rare combination of archaeological finds and historical sources, woven together, is incredible to witness, and they throw important light on Jerusalem’s past.” LOST ROMAN CITY THAT WAS HOME TO JESUS’ APOSTLES FOUND, SAY ARCHAEOLOGISTS The ancient mosaic inscription has been removed from the site and is being treated at the Israel Antiquities Authority’s mosaic workshop in Jerusalem. The discovery is just the latest fascinating archaeological find in Jerusalem. Archaeologists excavating the City of David in Israel’s Jerusalem Walls National Park recently uncovered charred wood, grape seeds, pottery, fish scales and bones and numerous rare artifacts that date back to the city’s demise at the hands of the Babylonians more than 2,600 years ago.